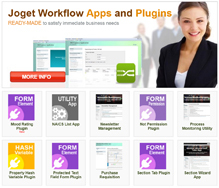 Be a Joget Workflow partner and enjoy advantages that can give your business the edge. If you sell, service, support and/or build solutions using Joget Workflow, here’s an overview of the benefits of our partnership programs that may be suitable for you. Each level of our partnership participation offers a broad range of customized benefits that can help match growth strategies with market opportunities and contribute to the overall success of our partners as well as the increasing number of quality businesses aligned with Joget Workflow. Check out our partners listing.